22 April 1874: The death of Biddy Early on this day. She was one of the last of the old style Faith Healers/Witches or Wise Women [bean feasa] that were a source of wonder and fear in Old Ireland who offered ‘cures & curses’ and advise to those who asked for it and could not afford the fee to see a Medical Man. Much Legend surrounds her activities and while she undoubtedly had curative powers and perhaps even hypnotic ones her chief claim was to possess a small dark glass bottle that she would look into to delve the answers to her clients needs. She was born circa 1798 in the County of Clare. She was the only child of John Thomas Connors and Ellen Early. While still a teenager she was turfed out on the road due to family tragedies and ended up in the Poorhouse. She was a spirited girl though and got out and found herself a husband - a man much older than her [more common then than now] with whom she had her only surviving child - a son. Before her mother died however she had passed on her knowledge of herbal medicine to Biddy. This knowledge would prove to be the basis for Biddy Early’s fame. She was illiterate. With her family and friends she spoke Irish, but she had some knowledge of English language. As a young girl Biddy was a bit of a loner and is said to have spent time in the presence of an sídhe aka ‘the little people’. Amongst the superstitious peasantry of the time this enhanced her standing and she became a magnet for those who needed her intercession with them over land disputes and those who wished to put a curse on their neighbours. However she did have some pretty good knowledge of traditional herbal remedies to ailments not just of humans but also of farmhouse animals. It is generally agree that she had a powerful and commanding presence and she did not like to be derided for her efforts. In an Age when barter was an acceptable method of payment she took ‘gifts’ of food and Poitín [locally distilled alcohol] to keep her ticking over. Indeed she had so much at times that her various homes became meeting places for socialising. Her Fame attracted attention however - not all of it complimentary. It is said that the Catholic Hierarchy disapproved of her methods and that priests denounced her and tried to silence her - but that she silenced them! It must be said though that a lot of Legend has accrued to her name and without hard evidence some aspects and events must be taken with a grain of salt. Her only known brush with the Law came in 1865 when she was accused of witchcraft under the Witchcraft Act 1586 and was brought before a court in Ennis. This would have been unusual even in the 1860s. The few who agreed to testify against her later backed out. She was released for lack of sufficient evidence. Of course there must have been many ‘Biddy Early’s’ over the centuries going back into pre Christian centuries who could work the magic and through skill and persuasion convince people to accept their cures and improve their lot in this World anyway. But she is the most famous of them all. 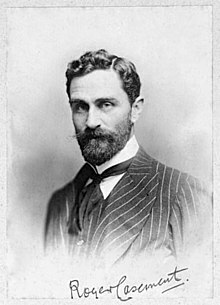 21 April 1916: The capture of Sir Roger Casement at Banna strand, Tralee Co Kerry on this day. He had been a distinguished member of the British consular service before the War but had become increasingly disillusioned with the British Empire and its role in the World, none more so on how Ireland was treated within it. On the outbreak of War he made his way to Germany to enlist its help to overthrow British rule in Ireland. But he felt that what help was on offer would not be enough to be successful. He requested a boat to take him back home and had decided within himself to use his powers to try and convince the IRB not to go ahead with a Rising. However if one were to take place he felt it his duty to be in Ireland at that time. After a series of mishaps he and his companions were transported to the Irish coast by the submarine U19 and near to where the SS Aud was attempting to land arms for the Rising to take place. But the U19, failing to find the ‘Aud Norge’, eventually landed Casement & his companions Monteith and Bailey by dinghy on the Irish shore. The dinghy overturned in surf on Banna Strand, near Ardfert Co Kerry. Casement had been ill for some time before the journey and was far too weak to travel or run. He took refuge in ‘McKenna’s Fort’ while Bailey and Monteith tried to make contact with the local IRB. However the local Irish constabulary were alerted & Casement was arrested, as were Monteith and Bailey shortly afterwards . They were taken to Tralee RIC barracks for questioning before being dispatched to Dublin.‭ From here Casement was rushed on to London and imprisoned in Pentonville Prison. He was charged with ‘Treason’. Put on trial his defence team put up a formidable set of arguments against his conviction but the evidence from the British perspective was damning. In addition the notorious ‘Black Diaries’ detailing his alleged Homosexual activities were used to undermine his reputation. He was hanged at Pentonville in August 1916. His remains was returned to Ireland in 1965 and he was given a State Funeral in Glasnevin Cemetery, Dublin. 20 April 1946: Johanna Mary "Hanna" Sheehy Skeffington Suffragette, Republican and political activist died on this day. She was born in 1877 in Kanturk Co Cork, the daughter of the future Nationalist MP David Sheehy &. Elizabeth "Bessie" McCoy. From an early age she was imbued with the spirit of political activity to free Ireland from British Rule and to improve the lot of women in Irish Society. Whilst still very young her family moved to Dublin. When Hanna was a teenager, the Sheehys held an open house on the second Sunday night of each month. They encouraged young people to visit them and their six children. The Sheehys were fond of singing and playing games, and would ask their guests to sing. Hanna was sent to Germany for a short period when she was 18 years old to get treatment for tuberculosis. After graduating from the Royal University of Ireland, she moved to Paris to work as an Au Pair and returned to Ireland in 1902. She sat for examinations at Royal University of Ireland and received a Bachelor of Arts degree in 1899, and a Master of Arts Degree with first-class honours in 1902. This led to a career as a teacher in Eccles Street and an examiner in the Intermediate Certificate examination. Hanna married Francis Skeffington on June 3, 1903 at University Chapel in St. Stephen's Green, Dublin. The couple wore their graduation gowns as a substitute for a traditional wedding gown and suit. Both husband and wife took the surname Sheehy Skeffington as a symbol of their honour for one another. It was this point on that her political activity really took off as her husband was as a committed activist as she was. In 1908 she was a founder member of The Irish Women's Franchise League dedicated to ensuring Votes for Women in Parliamentary elections. On 13 June 1912, she, along with seven other women, were arrested for smashing the glass windows of Dublin Castle. They served a month long sentence in Mountjoy Prison alongside another month after they refused to pay a fine. They were granted the privileges of political prisoners. Sheehy Skeffington was fired in 1913 from her job as a teacher at Rathmines School of Commerce for her continued involvement in feminist militancy. When the Great War broke out in 1914 she became involved in the anti-recruiting campaign and was prevented by the British government from attending a conference held in The Hague in April 1915 on Women’s Rights. The watershed in her life came during the Easter Rising 1916 when her husband Francis was brutally murdered by a deranged British Officer. She did not find out about his death until two days had passed. She joined Sinn Fein in the aftermath of the Rising. In December 1916 she went to the US to raise awareness of Ireland’s Cause and she attended some 250 meetings there across America. She was later imprisoned by the British in Holloway Prison London for actively opposing the War. In 1920 she joined a Dublin corporation as a councillor. She resumed work on The Irish Citizen and in 1919 became organising secretary of Sinn Fein. She opposed the Treaty in 1921 and again toured the USA in 1922 to raise funds to help Republican prisoners. In 1926 she joined Fianna Fáil as an executive, however she only kept this position for one year. She was disillusioned with the new Irish Free State and felt that women had not yet achieved their rightful place in Society especially in the new Irish Constitution of 1937. She stood for election to the Dáil in 1943 but was not returned. ‘She was very helpful, but she could also be quietly critical. When I told her that I and some friends were forming the Irish Housewives Associations she said, “You’re not wedded to the house, you know!”’. ‘She was very fond of animals and also of flowers, particularly the orange lily. People used to raise an eyebrow at this, and she would say, “I will not allow Orangemen to have a monopoly of this beautiful flower!”’. ‘It was startling to see on her mantelpiece a photo of a British officer in uniform. This was Major Sir Francis Vane, who had ordered an enquiry into the murder of her husband. He did all he could to see that justice was done, and it cost him his position in the British Army’. She died on 20 April 1946 and is buried alongside her husband in Glasnevin cemetery in Dublin. 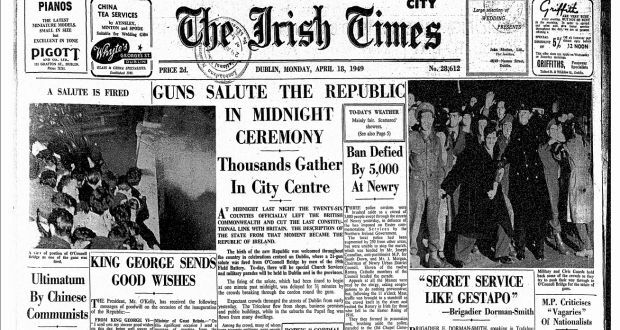 18 April 1949:The Republic of Ireland Act 1948 came into operation on this day. It separated the 26 County State [The Irish Free State] from the British Commonwealth and made her an Independent Republic in her own right. This momentous decision was taken some months earlier by the Coalition Government of An Taoiseach John A Costello. During his presence at a Conference in Ottawa, Canada he was miffed at his reception where he felt he had been deliberately embarrassed by the host the Governor General of Canada -Earl Alexander - himself of Ulster descent and one of Britain’s foremost Military Commanders of WWII. However the move had been under consideration for years [indeed the Government Parties had campaigned on this issue at the previous general election] and it became more plausible following the Declarations of the newly independent India, Pakistan and Ceylon as Republics in 1947. While they chose to remain within the Commonwealth the broad consensus at home was to get out. De Valera had stripped the ties between the State and the British Crown down to the bare minimum back in 1936 but he was reluctant to press any further ahead than that. In a way only a non FF led Government could have been sure to have carried the People with them across the board to see it through - after all De Valera could hardly object! In Dublin, tricolours flew from buildings – private and public – while papal flags adorned houses in the suburbs. The GPO was decked out in a green, white and orange plastic material. “As the time for the firing approached, a solid mass of people jammed the thoroughfare from O’Connell Bridge to the GPO Every possible vantage point was made use of,” reads the report. From the city, blazing tar barrels could be seen on the Dublin hills. At 11.45pm, O’Connell Street “became a blaze of light from searchlight batteries ringing the city.” A few minutes after midnight the salute from the guns began, with 10-second intervals between the rounds. Thus it came about that on the strike of midnight on 17/18 April 1949 the State was legally a Republic at last - though minus the Six Counties of the North which robbed it in some eyes of full legitimacy. However the status of the State as a Independent Republic has now survived 70 years even if greatly modified in its powers and remit through membership of the European Union since 1973. 18 April 1939: Ishbel Maria Gordon, Lady Aberdeen (1857-1939) died in Scotland on this day. Her husband Lord Aberdeen held the Viceroyalty of Ireland in 1886 and again from 1906 to 1915. Born Ishbel (Gaelic for Isabel) Maria Marjoribanks, she was the third daughter of the 1st Baron Tweedmouth and Isabella Weir-Hogg (daughter of Sir James Weir Hogg). On 7 November 1877 she married the Liberal politician the 7th Earl of Aberdeen (later the 1st Marquess of Aberdeen and Temair), in St. George's Church, St. George Street, Hanover Square, London. Both were fervent Home Rulers, and they were aware of the imbalance between urban poverty and the new rural prosperity. Lady Aberdeen founded the Women's National Health Association which established playgrounds in the Dublin slums and a depot to supply milk to the city's sick children. The Association, also opened sanatoriums and organised exhibitions, which travelled round Ireland as part of an intensive campaign against tuberculosis. A keen feminist, she did not endear herself to the social establishment by her efforts to promote women's rights, democratic attitudes, and religious and ethnic tolerance. She caused a social scandal while in Canada when she joined her servants to take high tea. The Aberdeens were given a huge farewell on their departure from Ireland in 1915. Lady Aberdeen was president of the International Council of Women for thirty-six years (1893–1936) and the National Council of Women of Canada for six years (1893–1899). When her husband was Lord Lieutenant of Ireland, she took up the fight against tuberculosis, starting the Woman's National Health Association. 'The Earl and Countess of Aberdeen had a greater impact on Dublin society than any Vice Regal couple since the Clarendons - but for very different reasons. They inspired some affection and a great deal of ridicule in the nine years that they spent in Vice-Regal Lodge. "he bearded and small and polite, she disproportionately large, matronly and masterful." However all recognised that she had a heart of Gold and a strong dislike of Injustice in this World. If she had faults they were far outweighed by her qualities of organising and basically cajoling the powers that be to improve the lot of the ordinary people. "I suppose everyone but yourself is a Home Ruler here tonight." "Not at all, Your Excellency", he replied frostily. "Barring yourself and the waiters there's not a Home Ruler in the room." 17‭ April 1876: The whaling vessel Catalpa rescued six Irish prisoners from British Captivity on this day. The ship under Captain George S. Anthony carried out one of the most daring and long distance rescues in history when she was used to spirit away the six Fenian prisoners from Freemantle, Australia. Even though the British quickly realised the men had fled and gave chase the ship could not be boarded as she flew the American flag. The rescued men (Thomas Darragh, Martin Hogan, Michael Harrington, Thomas Hassett, Robert Cranston and James Wilson) were brought safely to New York City. The Fenians John Devoy and John J. Breslin planned the rescue operation from America and Breslin was dispatched to Australia to co-ordinate the rescue. In July‭ ‬1874 the Clan na Gael Organisation in the USA decided to rescue the six prisoners who were excluded from a conditional pardon for all civilian Fenian prisoners. These men had been members of the British Army and thus considered outright ‘Traitors’ by the British. John Devoy was assigned to co-ordinate this rescue. He saw that funds were raised and a Captain George S. Anthony was ‘head hunted’ to undertake the dangerous mission. When it was put to him he was willing to take the risk. It was then decided that the voyage must look like a whaling voyage, thus Captain Anthony went looking for a suitable ship. In the port of Boston he found one that suited his needs and purchased the Catalpa, a three-master whaler, for $5200. The ship set out from New Bedford,‭ ‬Massachusetts, USA, in April 1875. The Voyage was undertaken with the deliberate intention engaging in a daring a yearlong mission of international rescue. On 28 March 1876 the Catalpa arrived off Bunbury Harbour, Western Australia and a meeting was set up between Captain Anthony and John Breslin. At this meeting they agreed the rescue date should be on 6 April. However due to the presence of a British gunboat at the Harbour and the information that another gunboat was due to arrive they rescheduled the rescue for 17 April. With the help of the prison chaplain,‭ ‬the six men escaped to the coast where Captain Anthony was waiting with a small whaleboat that would take them to the Catalpa. The resistance they overcame, both from armed British vessels and a furious sea storm, made their escape the stuff of legend. The British attempted to capture the Catalpa but Captain Anthony had the Flag of the United States raised and warned the prospective boarders that such a move would be viewed as an Act of War. They thought the better of it and the Catalpa made good her escape. The Catalpa landed the‭ ‘‬Freemantle Six’ in New York Harbour on 19 August 1876. Though Captain Anthony would never again put to sea in open waters for fear of arrest by the British, his rescue voyage, made mostly without the use of a functioning chronometer, is one of the greatest feats of seamanship ever recorded in nautical annals. 16 April 1958: Margaret Burke Sheridan the famous Soprano died on this day. At the height of her fame she was ranked amongst most famous Prima Donnas’ of the World of Opera. She came from a modest but respectable background in the town of Castlebar Co Mayo where her father was the Postmaster. However tragedy struck her early in life and by the time she was 11 she was an orphan. To further her education she was packed off to Dublin and placed in the care of the Dominican nuns at Eccles Street, Dublin. It was there that she received her first singing lessons from Mother Clement who was a noted music teacher. Margaret won a gold medal at the Feis Ceoil [Festival of Music] in 1908 and showed so much musical promise that a benefit concert was given in the old Theatre Royal in Dublin to help fund her studies at the Royal Academy of Music in London. It was there that her career really took off as was given leading roles in some of the leading Operas of the day. She quickly became known as ‘La Sheridan’ as her fame spread. It was there that the great inventor Marconi heard her sing and proclaimed “yours is the voice I’ve been waiting to hear all my life”. He decided that she must go to Italy to further her career. She became a singing sensation in Italy as audiences were captivated by her rich and lyric soprano voice. The conductor Toscanini dubbed her “the Empress of Ireland” and she was chosen to sing at the wedding of the Italian Crown Prince, Umberto. Margaret made numerous recordings including the first ever complete recording of Madame Butterfly in 1930. In the 1920’s People said there were only three people known outside of Ireland, Eamon De Valera, John McCormack and Margaret Burke Sheridan. But Margaret’s time at the pinnacle was to be a short one. In 1936 she developed throat problems that stymied her career. She had an operation but it was limited in its success. In an Art where perfection is paramount she realised that her time was up and chose retirement over ridicule. She returned to Dublin and while she kept away from the Limelight she did continue to sometimes sing, notably her interpretations of Moore’s Melodies and her rendition of Balfe’s “I Dreamt I Dwelt in Marble Halls”. She sang in public on and off but basically she just socialized around the town where she was known as quite a character. She kept a small flat near Fitzwilliam St and was a ‘regular’ in the exclusive Shelbourne Hotel. Her end came in April 1958 when she died in the Pembroke Nursing Home on Leeson Street. She is buried in Glasnevin Cemetery Dublin.